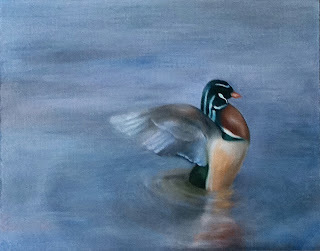 After seeing the little watercolour ducks I'd painted (see "Quack" post for photos) my mums boss asked if she thought I could paint wood ducks, she just loves wood ducks and who can blame her, they are so beautiful! So here it is. The Wood Duck. Oil on linen panel. 26 x 28cm. 2012.